As the 2006 IRF Racketlon World Tour makes this year's third stop at the fashionable Badminton & Racquet Club of Toronto during the upcoming weekend nothing but a big surprise could stop Toronto native Richard Thomson to pick up his first tour title and the $800 (Canadian) prize cheque. 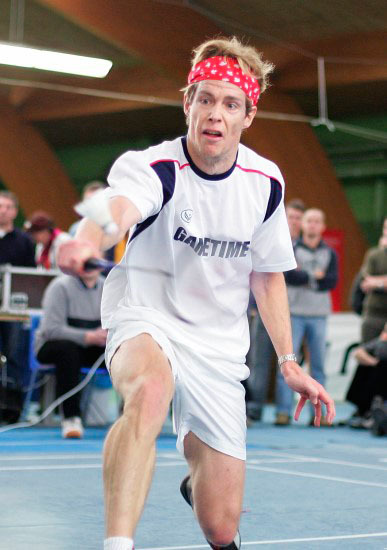 After having gained a remarkable 13 points in table tennis (Eliasson complained after the match that the ball came at him "like a snake" - a reflection of the fact that Thomson tried a new unusual rubber) and a safe win in badminton, many in the audience started to predict a Canadian in the World Championship final. Especially, since some of them knew that Thomson was aiming for a big positive difference in squash. But that turned out to be the wrong strategy in this match. Aiming for a big positive difference implied a safe game without errors and very long rallies. He will probably not try that against Eliasson next time, Thomson said after the match; "His retrieving was better than I expected". And a calculated big win was slowly and exhaustingly turned into a clear defeat 15-21 and that is where the match was lost. At the 2006 Canadian Open there is no Eliasson and no Kärkkäinen. So who could possibly stop Thomson?